No internet connection is required to use the app to collect spotting pictures and/or maintain the spotting data. An internet connection is required to purchase any locomotive catalogs. 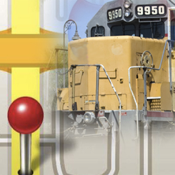 The app uses railroad locomotive engine numbers cross-referenced to model type from thedieselshop.us web site to identify the locomotive photographed by the “spotter”; the data is contained in various “catalogs”. The app itself comes without any catalogs, but the Apple In-App Purchasing function enables users to download - for a small fee - catalogs of various US railroads. The initial catalog provides data for US Class I railroads, major passenger lines, and selected regional and short-line railroads. The second catalog release is planned to include additional US passenger, regional, and short line railroads. Limited International railroads listed by The Diesel Shop is planned to be provided in a subsequent catalog release. For more details and FAQs, click on the link to the support page below.